The Common Dogwood (Cornus sanguinea) is a, fast-growing, hedging tree, putting between 30cm (1ft) and 45cm (1ft 6in) of new growth each year. 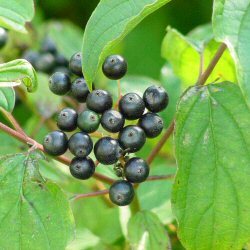 A non-evergreen, it is marked for its small, white, decorative flowers, which are produced during Summer, as well as small non-edible black berries, which form in late summer to autumn. Its most striking feature occurs during Wintertime when the leaves have fallen and strikingly beautiful red-orange stems are revealed. Our Dogwood hedging trees are sold as plug plants, in other words the roots are encased in compost. This means that planting can be carried out at any time of the year, provided they are watered in periods of drought, compared to bare-root plants which can only be planted during the plants normal dormant period (November to March). All of these trees are UK grown, which is important for successful establishment. How many Dogwood hedging trees do I need?